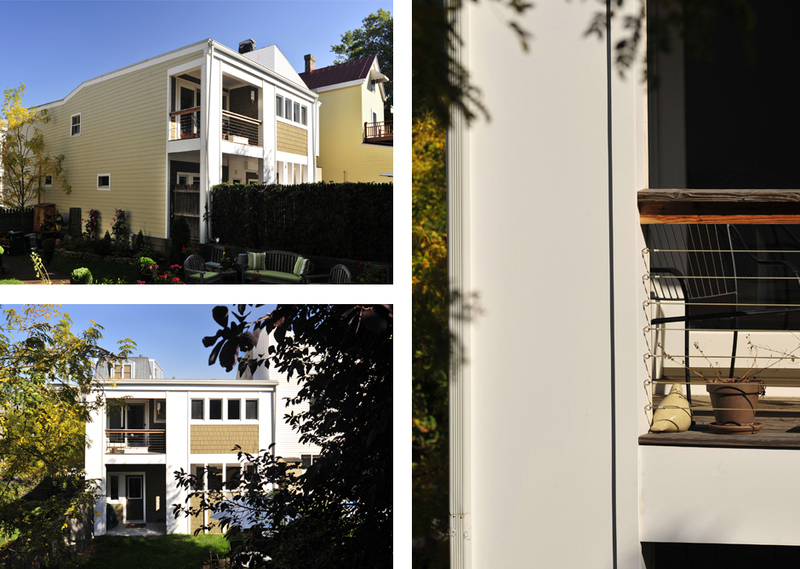 The challenge behind this project was to save a circa 1910s urban frame residence by increasing the size while stabilizing it structurally and making it more energy efficient, all while staying on a budget. The clients asked for a quiet bedroom suite that afforded privacy while adding a contemporary dimension to the house. This design added a modest master bedroom and two bathrooms on the second floor above a structurally unstable early addition to the back of the house. On the first floor we added a bar area and transitional space to the backyard off the existing kitchen. The design concept stemmed as much from the structural needs of the house as the functional needs of the owners. Structurally, we installed new columns within the existing rear wall, extended beams over the unstable one-story addition about six feet into the rear yard, and built a new shear frame as the rear façade. The shear frame afforded us the opportunity to explore solid/void relationships while screening the existing rear condition and adding a variety of covered outdoor spaces. The owners stayed within budget and loved the design.